Who really is Tussaud’s Sleeping Beauty? 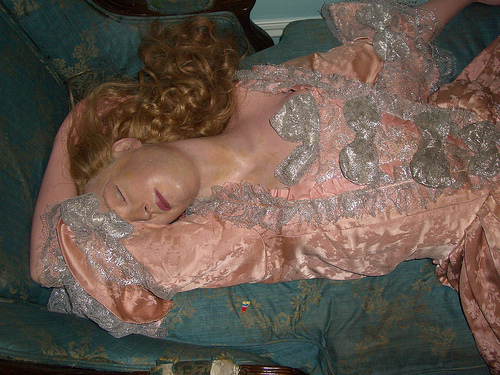 While researching for a short story set in the time of Louis XV, I came across Madame Tussaud’s Sleeping Beauty. This waxwork, sculpted in 1763 (according to Tussaud’s website), is the oldest in the Tussaud’s collection in London, and features simulated breathing. Tussaud’s say it’s modelled on Madame du Barry, Louis XV’s mistress. But, Du Barry was not Louis XV’s mistress until 1768. Curiously, the portrait is in the Wallace Collection in London, which is just around the corner from Tussaud’s in Baker Street. Madame Tussaud herself was not born until 1761, so the figure must have been sculpted by her mentor, Philippe Curtius. She joined him in the waxwork business, and he left it to her when he died in 1794, thirty years after the Sleeping Beauty’s creation. Perhaps, during this time the original model of the waxwork was forgotten.